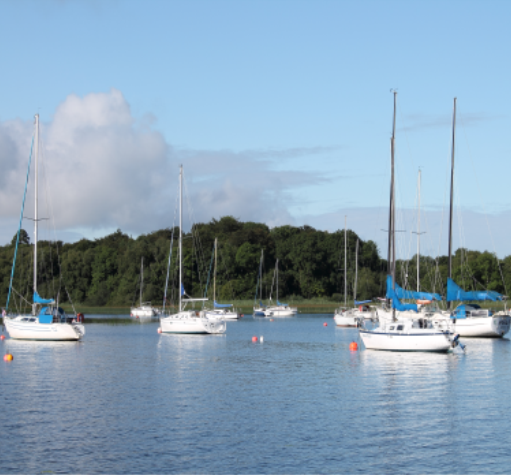 Iniscealtra Sailing Club is located on the shores of Lough Derg at Mountshannon, Co.Clare. It takes it’s name from the nearby monastic island known as Inis Cealtra or Holy Island (English). With the increase in numbers, plus the increase in boats using the main harbour, the Club looked around the immediate area and made the decision to purchase a prime site on the shores of the lake, adjacent to the main harbour, from where they could run the club events. In 1984 the club formed a limited company and in 1985 the deeds were signed and ISC became the proud owners of the new club site. Plans were put in place to develop this land which has resulted in the fine harbour, clubhouse, recreational and parkings areas that you see today. The number of members increased and the interest in sailing and racing sail boats grew progressively.